Shrubby cinquefoil ‘Red Ace’ or potentilla fruticosa ‘Red Ace’ produces bright red flowers with yellow centres in summer which last through to the autumn before fading in October. As an added bonus, the colourful flowers fade to orange if they are positioned in full sun, which will create a lovely effect and makes the flowers stand out even more than in their original condition. Small, lance-shaped, pinnate leaves make a great backdrop for the blooms in summer. A deciduous shrub, the appealing grey-green leaves do not remain green all year round, but turn a striking coppery red when autumn arrives, when they are considered by many to be even more attractive than their green state. These two features combined make shrubby cinquefoil ‘Red Ace’ a must have for just about any garden enthusiast. Potentilla ‘Red Ace’ has a compact, rather twiggy growth habit, which makes it great for hedging, but it is also very suitable as a specimen shrub or as a shrubbery element. As it won’t grow particularly large, it would also make an excellent addition to a border. 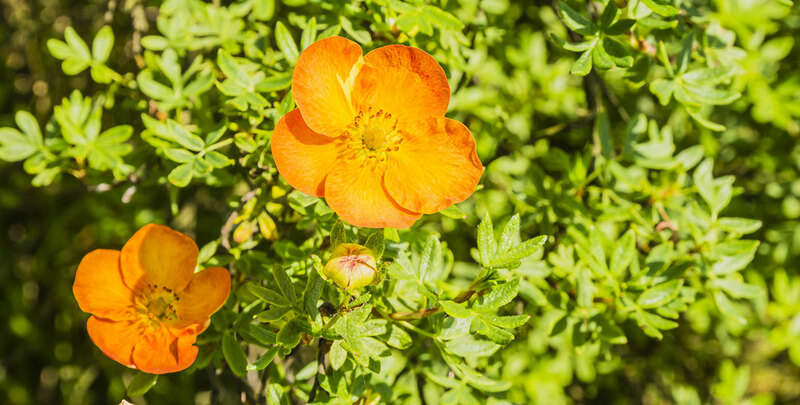 This multi-faceted shrub is very versatile and trouble-free – potentilla hedges hardly ever suffer from diseases, tolerate a wide variety of (well-drained) soils and can cope with temperatures all the way down to -20C, so it is fully hardy in all parts of the UK. Potentilla ‘Red Ace’ requires no trimming, but it can profit from minimal pruning if you would like to keep it neat, for example to create a more formal type of hedge. Potentillas have a high tolerance of pruning, which allows you to prune them as desired. Shrubby cinquefoil ‘Red Ace’ is happy growing in a moderately fertile, preferably moist soil, but is tolerant of dry periods.